Following the 2016 publication of Wolfgang Streeck’s How Will Capitalism End and Adam Tooze’s subsequent review of the book, a heated debate broke out between the two in London Review of Books. According to Tooze, Streeck had turned ‘critical theory into a vehicle for the assertion of the primacy of the nation’ on account of his ‘alarming’ distinction between a ‘Staatsvolk’ and a transnational ‘Marktvolk’ (Tooze 2017). Streeck, on his part, denounced this as ‘the class rhetoric of faux cosmopolitanism as it flourishes among a soul-searching urban-academic middle class in the post-Brexit moment’ (Streeck 2017). While neither author would probably concede to the position assigned to him by the other, the controversy is an illustrative example of leftist scholars trying to make sense of the role of the sovereign state in the economic-political development since the financial crisis. On the one hand, we have the intellectual disquiet in the face of rising nationalism and isolationist return to national sovereignty, while on the other hand, we have the defense of national democracy against the usual suspects of neoliberal (mis)management since the crisis, in this case represented by the European monetary union and the ECB. The sovereign state is problematic to critical political thought because it is in itself a form of institutionalized power, while at the same time it appears to be the last safeguard against the ever more global, and therefore increasingly catastrophic caprices in market forces. 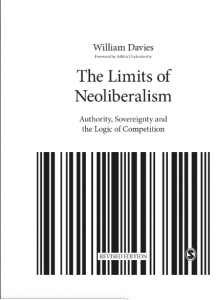 The revised edition of William Davies’ 2014 book The Limits of Neoliberalism: Authority, Sovereignty and the Logic of Competition confronts the issue of neoliberal competition, dogmatism and the role of sovereign power head on. By tracking the evolution of neoliberalism from market metaphysics to the non-normative depoliticized Realpolitik of the present, which the author terms ‘contingent neoliberalism’, it relates this shift to changes in the perception of the relationship between politics and economics. Scholars in political philosophy will probably find Davies’ commentary on thinkers such as Emmanuel Kant, Hannah Arendt, Carl Schmitt, and Giorgio Agamben, among others, hardly revolutionizing. Hence, the engagement with the philosophical tradition should not be the main motivation for reading the book; rather, Davies uses simplified versions of canonical philosophical concepts to map out the differing positions of the neoliberal field, in line with his sociological method of convention theory, inspired by French sociologist Luc Boltanski. In response to critiques of and investigations into neoliberalism, it has often been claimed that there is no such thing at all (e.g. Altman 2005; Talbot 2016). The main arguments of this retort are first that neoliberalism is an ideology without followers, and second, that the word covers an array of opinions so disparate that it effectively becomes meaningless. Perhaps it is in response to this skepticism as to the existence of the object of scrutiny that many accounts of neoliberalism have sought to emphasize the theoretical common ground of the neoliberal tradition, while at the same time insisting on the contradiction of neoliberal free-market ideology and centralized governing techniques, as is the case in Colin Crouch’s and David Harvey’s important works (Crouch 2011; Harvey 2005). Davies takes a different approach: Rather than looking at neoliberalism as a more or less coherent theoretical unity (with internal differences and disputes), he creates a sociological cartography of some of the most prominent neoliberal positions, focusing on the development and transformation of key concepts within a field of tension. Some of the main tensions center on the metaphysical conception of the market, on competition, and on human equality or inequality. To the early neoliberals, notably represented in the figure of F.A. Hayek, the market was a self-regulating, just system of distribution guaranteeing the best conditions for societal prosperity. ‘The market’, Davies argues, was a normative principle for the automatic evaluation of empirically observable human conduct, and not in itself an object to be observed. The assertion of the fairness of market mechanisms rested on an assumption about the fundamental equality of humans. Because people are equal they have an equal chance of succeeding on the market and thus, whatever happens to them in the sphere of exchange is a just evaluation of their freely chosen actions. In this, Hayek is in accordance with traditional laissez faire liberalism: equality of opportunity justifies inequality of outcome. This dynamics is played out as competition between individuals playing by a common set of rules guaranteed by the state such as that of property law. From this original state of relative liberal innocence, Davies goes on to describe two pivotal events in the downfall of neoliberalism. The first was driven by Ronald Coase and left its lasting mark on the Chicago law and economics tradition. According to Davies, Coase shifted the focus from the evaluation by the market to an evaluation of the market based on the new dogma of efficiency and conducted by economists rather than the self-regulating system of competition. Coase thus replaces the freedom of choice ethics of the market with a sort of ‘Benthamite utilitarianism’ of efficiency. Competition ceases to be an evaluative system and becomes an object of economic expertise and government intervention in itself. Additionally, the efficiency criteria is not limited to the market, but can be employed to evaluate public institutions as well. The second digression from Hayek’s conception of the market follows Joseph Schumpeter in his focus on the entrepreneurial individual as the primus motor of innovation. The entrepreneur is thus essential for the dynamism of the market, yet since the figure is seen as an uncommon individual it essentially deviates from the original liberal assumption of equality which is at the root of the ethical legitimacy of the market evaluative system. The entrepreneur does not play by the rules set out before the competition in a Rawlsian state of ignorance – he invents the rules and wins the competition by changing its preconditions. Common to these two paradigms, Davies argues, is their move away from the market as an institutional framework for competition towards more psychological forms of competition not limited to the sphere of the market. Yet they differ in the view of agency: where Coase maintains an assumption of equal rational capabilities for judgement of efficiency, Schumpeter asserts a necessary exceptionalism of certain outstanding individuals to keep competition in permanent evolvement. As Davies claims, ‘applied neoliberalism is arguably based on some entanglement of these two anthropological worldviews, whereby certain powerful actors are able to purchase and acquire a greater calculative and strategic capacity than others’ (57). This contradictory anthropology undermines the ethical foundation of neoliberalism, and as the neoliberal techniques of evaluation moves into the sphere of politics (not least through the growing presence of economists in legal institutions), the political discourse of fairness is replaced with an economist discourse of necessity, efficiency, and international competition. Enter sovereign authority. The paradox of neoliberal governance is that it seeks to replace political irrationality with economic rationality, but as it depoliticizes its own founding principles it effectively empties itself of any legitimating arguments for its dominance. Hence, when a major crisis such at the financial crash of 2007/2008 hits, demonstrating the inefficiency of the efficiency regime, economic governance has no viable option but to rely on the sheer force of sovereign decision backed by power. This is the central point of the book and constitutes the contingency of contemporary neoliberalism. Going beyond the scope of the book and applying Davies’ analysis to the introductory dilemma of this review, this contingent sovereign decisionism at the advice of economic experts might be key to explaining the reactionary recourse to more familiar forms of sovereignty. As Davies notes, in the new preface to the revised editions, 2016 saw the ‘revenge of politics on economics’ (xiv). The preface is a valuable addition to the book as it relates the political earthquakes of events such as Brexit and the Donald Trump presidential campaign. Neoliberalism is essentially, Davies writes, ‘the disenchantment of politics by economics’, yet politics has now returned with a vengeance in the guise of the strong sovereign. Moderate UK politicians had put their faith in economic arguments to persuade voters that the only reasonable option was to remain in the EU, however, a majority of voters did not care for the rationalism of economics (or economists). This awakening to the new reality of repolitization has been slow among certain commentators as in a recent editorial on the rise of socialism among millennials, The Economist unsurprisingly denounces this tendency on account of its alleged economic unsustainability: ‘empowering workers to resist change would ossify the economy. Less dynamism is the opposite of what is needed for the revival of economic opportunity’ (The Economist 2019). This argument repeats precisely the age old song of economic necessity which the new political tendencies are to a large degree reactions against: the appeal to competitiveness might resonate among the magazine’s readers, but it certainly has no effect on millennial socialists. It is on this basis that Davies’ book shows how neoliberalism has eroded its own normative foundation and is now at a loss for political arguments. Readers of Marx & Philosophy Review of Books may be disappointed by the conclusion of the book as it is not a Marxist critique. Marx is not mentioned, and Marxism is brought up only once. Instead, the book is comprised of a defense of political liberalism against economic neoliberalism: the rationality of the market must be contained within the limits of the market and not be allowed to permeate all areas of social life. Only then ‘can liberalism be practically saved in any meaningful way. This means radically reducing the scope of economics again, and rediscovering rival measures and theories of value’ (Davies 2017, 196). While the strategy for saving liberalism from neoliberalism remains underdeveloped, the critique itself is enlightening in its lucid presentation of the diverse field of neoliberalism and its internal contradictions. Readers from across the critical spectrum will therefore gain insight from the book’s presentation of a narrative of a liberalism that has turned on itself. The problem with the use of the term “neo-liberalism” is that, in practice, there is nothing very “liberal” about it. This becomes readily apparent in the real world, when real people in real “neo-liberal” societies try to do something significant and challenging which is quite different from the norms of the rich bourgeois elites and the fat-cat labour aristocracy: immediately, a whole repressive clobbering machine descends on them, to knock the innovators down, shut them up, steal and modify their idea, tell them what they can and cannot do, or regulate them, etc. Moreover, even the most ardent and intelligent theorists of neo-liberalism do not actually call themselves “neo-liberals”, because they see themselves as “true liberals”, faithful to, and staunchly promulgating, the core ideas of the liberal creed. I also think that Davies conceptualizes neo-liberalism the wrong way. Originally, what “neo-liberalism” meant, was that classical liberals accepted an enlarged (Keynesian) role of the state to pull the capitalist economy out of the 1930s depression. They accepted, that “more market” policies would not do the trick, because workers whose wages were minus zero could not buy commodities. And they accepted a larger role for the state, during the world war, and in the era of postwar reconstruction. The very idea, that large-scale state intervention (based on deficit-financing) was necessary to save the market economy was however alien to classical “laissez faire” liberalism, hence the prefix “neo-” to denote the survival of liberalism in a modified way. The subsequent new meaning of neoliberalism which emerged in the 1970s and 1980s was in fact the reversal of the old meaning. That is, when the postwar boom collapsed, liberals put the blame not on capitalism, but on the enormous growth of a state bureaucracy which was regulating everything. The new “neo” was about the mistaken faith in the enlarged role of the state. So the new meaning of “neo-liberalism” referred to a new program, to *reduce* the role of the state in the economy, and *increase* the scope of market trade. Once free enterprise, market trade and private initiative were unleashed (through privatization, deregulation and union- busting), so it was argued, then economic growth would return. The intellectual stars of this program were people like Friedrich von Hayek and Milton Friedman, who had been arguing these ideas for a long time already, but who were suddenly a hot item. The talk follows the money. From a Marxian perspective, however, both the old neo-liberalism and the new neo-liberalism are only the “ideological reflex” of the real processes of change in the modus operandi of bourgeois society. As Marx said, you have to distinguish between the “real class conflict” in objective reality, and “the way in which people become conscious of it and fight it out”. Unfortunately, however, today’s academic Left confuses the *ideological* articulation of neo-liberalism with the *realities* of capitalist development. They do that, because they live in a world of ideas most of the time, they are idealists, not historical materialists. This tends to lead to political confusion, because it implies that “more market” is bad, and that “more state” is good, which leads straightforwardly to programs to reform state activity as a way to create a better society, without any critical debate about what is actually happening to social relations, human relations, forms of organization, property rights etc. in the real world – never mind real and useable research about it. It is rather obvious that this confusion can be cleared up only by going beyond the ideological “rhetoric” of neo-liberalism, and by focusing on the “realities” of capitalist development in our epoch. Regrettably though, there is not much prospect of this happening, since most Marxist scholars are no longer interested in the analysis of reality, as Marx was, but only in abstract literary discussions about “fetishism”, “reification”, “value theory”, “power”, “dialectic”, “the commodity form” etc. The question is no longer whether concepts have any purchase on reality, but whether the concepts have a “tasty flavour” or an “exciting fragrance”. In which case Marx becomes just a brand like any other. Some people like it, others don’t.